1. Malaysian Airline System Berhad, or widely known as Malaysia Airlines (MAS) is our first flag carrier. Operating flights in all continents, it is also listed as one of the seven airlines to be ranked as a 5-star airline by Skytrax. Apart from this, it has won awards for its service and safety by many international bodies. 2. MAS has forged many agreement with several regional and international airlines to provide various services. Malaysia Airlines showed its commitment as both a carrier as well as a responsible corporate citizen in the global community. 3. Although MAS has received many notables achievement and excellence, this Government-Linked-Company (GLC) is now facing financial problems. There have been some major cooperation restructuring to maintain its world-class standard in terms of operational productivity, service levels and costs. From what I know, the business environment had already weaken long before the 'terrorist' attack on the World Trade Centre. 4. Here are some examples on Malaysia Airlines' conservatives losses. On first adoption of this, Malaysia Airlines had huge losses of RM3.95bil, which were taken straight into the balance sheet – not via the profit and loss account. These losses are not actually realised but represent the losses if oil prices remained at the level they were at Jan 1, 2009. 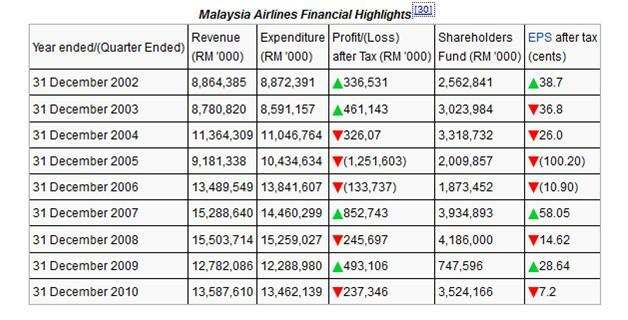 For the first quarter of the year to March 31, 2009, Malaysia Airlines, as oil prices continued to decline, made huge hedging losses of RM567mil, pushing net losses to about RM695mil. Why, when oil prices are declining, should Malaysia Airlines lose in terms of hedging? 5. After that, I would like to share with you some figures on MAS performance from 2002 till 2010. Roughly, our flag carrier had lost around RM 40 million for the pass eight to nine years during it's operation (based on the table below). I would like to highlight it again, "we are not making money but we are actually losing RM 40 millions after all these years." 6. Today's question revolves around on how Malaysia Airlines is going to generate cash after its major losses. This year we were shocked with its recent share-swap with Air Asia. People from MAS are saying, there is a need to overhaul the operating aspects and marketing strategies of the lost-making airlines. But Air Asia recommends "re-branding", which is a common cliché in a negative business environment. Don’t you find it strange? What happens to the people who have been managing MAS all these years? 7. For me, the story of MAS is a sad one as the people who are entrusted to look after its interests are pushing it deeper into "artificial" problems and now applying an artificial solution. Swapping-shares appears to me as an easy way out without a proper analysis of the airlines past, current and future situation including the welfare of MAS staff and customers’ needs. 8. Moreover, I see that Malaysia Airlines is one of our international ambassador as it has always been. Portraying our culture and promoting our national identity, truly a national treasure that requires everyone's attention, including you. 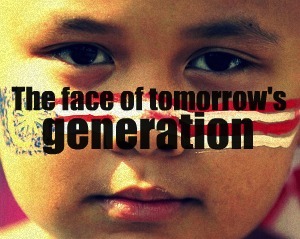 p/s: Share with us some opinions and ideas on how to save our national flag carrier. Thank you. MYWorkLife, an online communication platform, is dedicated to returning Malaysians or foreigners who are interested to work in Malaysia. It is also for local talents as well as graduating students from both local and foreign institutions. It provides the relevant information and also serves as the preferred central information on Government Linked Companies as well as the broader Malaysian environment. You can also post your resume on MYWorkLife and view vacancies post by the relevant Government Linked Companies. Want to know more? Click on the image above.